ROME (CNS) — For the head of the Ukrainian Catholic Church, “authenticity and simplicity” characterize the man who mentored him as a young bishop and who has just been elected Pope Francis. Archbishop Sviatoslav Shevchuk said Pope Francis’ simplicity and commitment to a new form of evangelization was exemplified when he came out onto the balcony of St. Peter’s Basilica for the first time March 13 and bowed as he asked people to pray for him and ask God to bless him. “He spontaneously rejected the kingship of the papacy,” the archbishop said. The gesture, he said, was vintage Cardinal Jorge Mario Bergoglio. Some people were surprised when the pope said March 16 that he wanted a church that was poor and was with the poor. “I can assure you, that was not simply PR (public relations). That is how he is — as a person, as a pastor, as a celebrant, as a bishop, as the pope,” the archbishop said. The archbishop was present at many Masses in Argentina where then-Cardinal Bergoglio was the chief celebrant. His homilies “were always very short, but very sweet,” he said. In fact, he said, at the solemn Mass celebrating Argentina’s 200th anniversary of independence in 2010, “he said just six sentences, but there was a silence in the cathedral for almost 10 minutes” when he finished as people thought about what he had said. “As a celebrant, he tried to be really simple in his relationships with the people and with God. That is why, sometimes, he will break some protocols,” the archbishop said, particularly by sharing the sign of peace with as many people as he can reach. 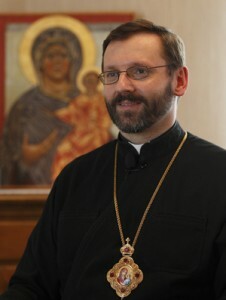 Archbishop Shevchuk, who was sent to Buenos Aires as an auxiliary bishop at age 38 and was named head of the Ukrainian diocese there before he was 40, said he expected his former mentor to be an ecumenical pope, a father and pastor guiding Catholics on moral issues and a priest who focuses on Christ when celebrating the liturgy. “It wasn’t so easy for me, so I was looking for someone who could be my guide, someone I could ask for help,” someone to go to when there were problems, said Archbishop Shevchuk, who will be 43 in May. “I was so lucky to find that person in the person of the archbishop of Buenos Aires,” now Pope Francis. The new pope knows the Byzantine liturgy and the Ukrainian Catholic Church from his youth, the archbishop said. As a student at a Salesian school in Buenos Aires, he would wake up early each morning and go to Divine Liturgy with Ukrainian Father Stepan Chmil, who is now deceased. As archbishop of Buenos Aires, Cardinal Bergoglio also served as the ordinary for Eastern Catholics who did not have their own bishops in Argentina. As ordinary, he was responsible for ensuring Eastern Catholics had their own priests and for guaranteeing their pastoral care. Archbishop Shevchuk said Pope Francis was present several times when he presided over a Byzantine Divine Liturgy during meetings of the Argentine bishops’ conference, to which they both belonged. Whether at an ornate Byzantine liturgy or the rather simple papal liturgies he has celebrated since becoming pope, understanding Pope Francis’ liturgical approach is another area where “the word ‘authenticity’ can help us,” the archbishop said. The new pope, whether at a Divine Liturgy or a Mass, “seeks full union with Christ, especially with the eucharistic Christ who is present,” he said. The Ukrainian archbishop expects Pope Francis to be an “ecumenical pope,” primarily because of his ability to create authentic, profound relationships with others. As a bishop in Argentina until his 2011 election as the major archbishop of Kiev-Halych and head of the Ukrainian Catholic Church, Archbishop Shevchuk watched the then-Cardinal Bergoglio in action in the public arena when issues of public policy and morality were discussed. “It was an interesting time to see how the church defended the dignity of the human person, the dignity of the family and the dignity of human sexuality. The approach of Cardinal Bergoglio to those issues was the approach of a father and pastor. He wasn’t a judge. He was defending not abstract rules, but the dignity of the human person. That was his way,” he said. “He was very tolerant to persons,” he said. But “he wasn’t tolerant to wrong ideas or aggressive ideas” presented in legislation. “But even when he was taking the strongest positions, he was doing that with humility, kindness, in love,” the archbishop said. Pope Francis believes what he said March 17 in his Angelus, that God forgives always, “and he tries to imitate his God,” the archbishop added. Even though Pope Francis did not specifically mention the Second Vatican Council in his first formal speeches, “everyone who looks at him can see the spirit of the Second Vatican Council shining on his face,” the Ukrainian leader said. Archbishop Shevchuk said he fully expects to continue to be surprised by Pope Francis as he continues his ministry, but he is certain that the new pope’s authenticity and simplicity will offer the world an alternative to secularism and a boost for the new evangelization — the effort to strengthen the faith of practicing Catholics and bring back those who have fallen away.